The two main things you will need are a solar panel itself and a solar controller of some kind – the voltage output of solar panels is dependent on how much light they get and without a suitable controller they could overcharge and damage the batteries they are connected to. We wanted solar to extend the time we can spend without needing to run a generator when in the mountains in the winter – obviously the hours of daylight are shorter in the winter and the sun is low in the sky, both of which reduce the amount of battery charge you can expect to gain in a typical day. 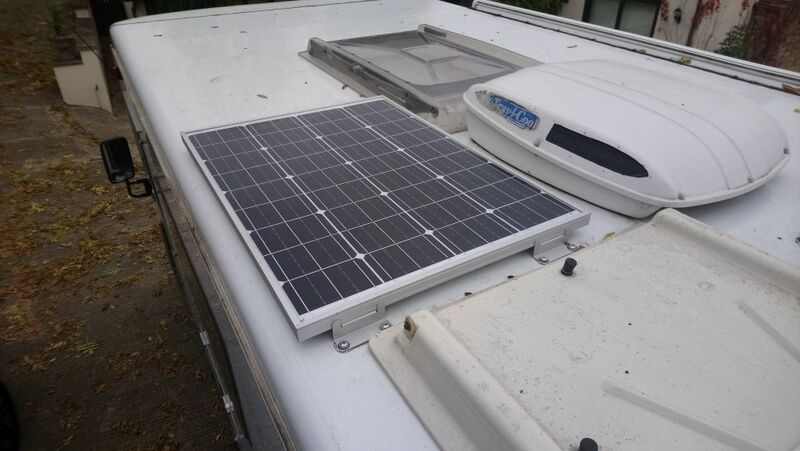 I settled on a 100W mono-crystalline solar panel as a good trade-off of size, weight and cost – it was about £77 delivered and mounting hardware was another few £’s. For the solar charge controller I went for a Schaudt LR1218, which can cope with 18A throughput (way more than my panel is ever going to give!). It has connections to allow it to be hooked up directly to your leisure batteries (and starter battery if you wish) but also comes with cables for connecting it directly to Schaudt Elektroblock units (our bus uses an EBL 4-105 ). 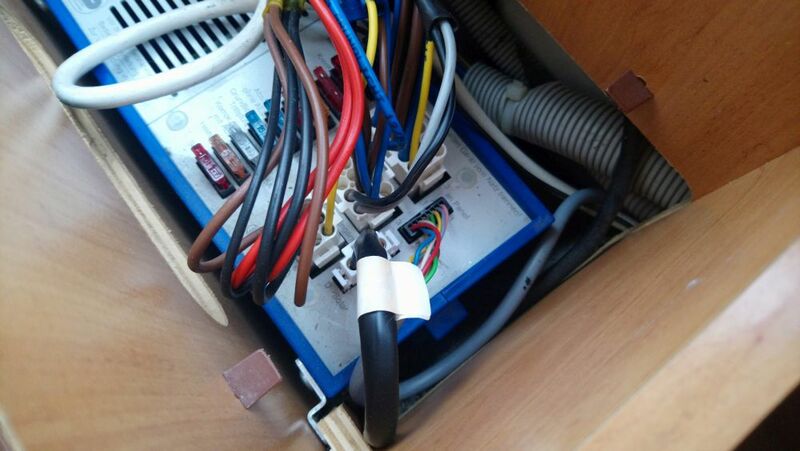 Connecting it up this way means the current the solar is providing will show on the current gauge on motorhome control panel – in the same way it does when you are charging via the electric hook-up. One thing to bear in mind when choosing where to mount your panel is that a shadow across even a small part of the panel can reduce it’s output to almost nothing – even the sections still in the sunlight will not produce current if part of the panel is in shade. So if you have anything that sticks up significantly from your roof (like a satellite dish for example) make sure it’s not going to cast a shadow across your panel. 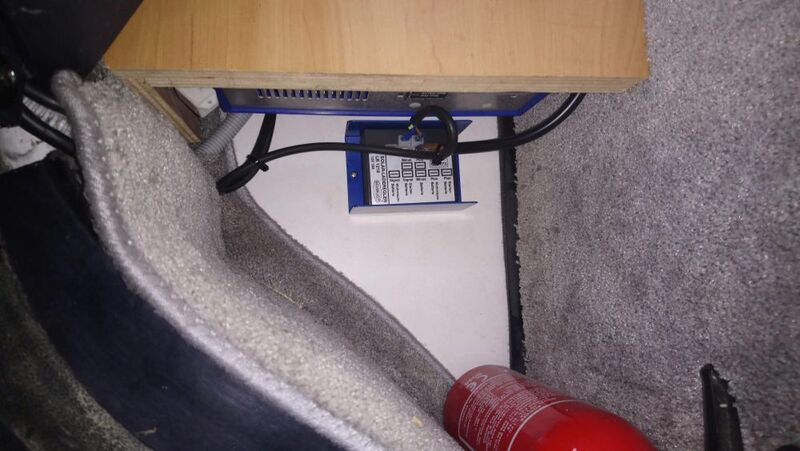 Note – there is nothing special about the solar socket – it’s just a connection to the leisure batteries via a fuse on the correct side of the current shunt to allow the current to show on the control panel. There’s no reason you couldn’t use this socket for connecting a wind generator, auxilliary charger etc. Once connected that’s all there is to it! A couple of hours work and about £150 in parts and you’re all done.